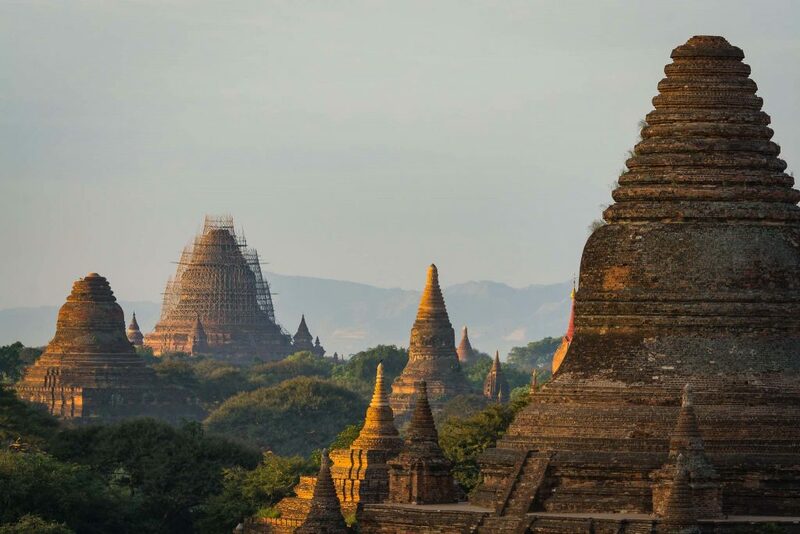 What to See and do in Myanmar? You’ve landed in the right place. After my second trip to Myanmar, I’ve seen some of the best that the country has to offer. 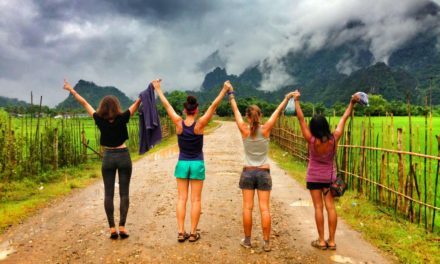 Even though I love Malaysia and Thailand, I’d probably consider Myanmar the best overall travel experience in southeast Asia. Although it’s the obvious starting point for a trip to Myanmar, most travelers don’t linger here. For me, it’s one of the most interesting cities in southeast Asia. 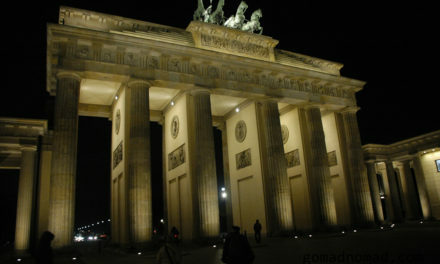 It doesn’t have a lot of traditional sights to visit, but its street scene is tops. I love wandering through the wet market which lines a side street of downtown Yangon. Fishmongers are dicing up the morning’s catch on wooden cutting blocks, young guys are hauling goods in and out, and monks are carefully weaving through the foot traffic collecting alms. It’s so busy that even as a foreigner, you’re almost invisible. In the evening, head down to the docks where small wooden skiffs plow across the river as taxis. The city has a lot of beautiful colonial architecture, that is both decaying and restored. A foodie scene has recently emerged for expats and travelers. And of course, the traditional street food is as good as ever. The local tea shops remain a popular place to sit and chat the afternoon away as well as try some tea leaf salad. If it’s traditional sights you’re looking for, visit Shwedagon Pagoda. 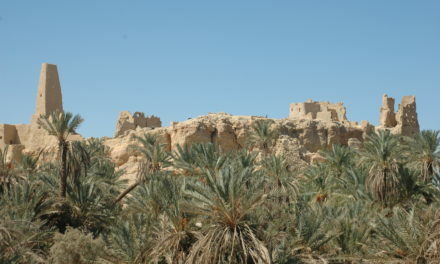 Although it’s a place of pilgrimage for most, it is a fascination peak into religious devotion. Food in Myanmar oddly has a bad rap. But these travelers just aren’t eating at the right places. 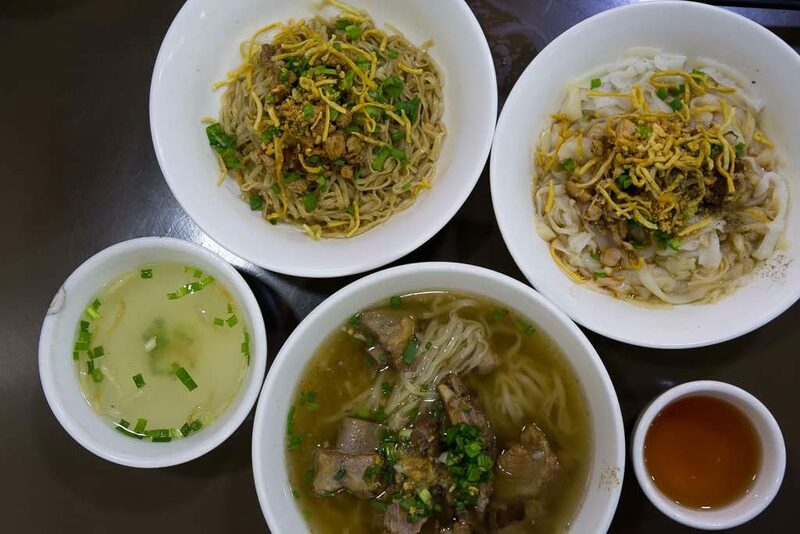 Besides Burmese food, you’ve got the cuisines of other regions and ethnic groups starting with Shan, Rhakine, and Mon. My friend, Dustin Main, recently opened my eyes to the wonderful food of this country on his recent Un-Tour to Myanmar. The trip was supposed to dig deeper into the culture and contemporary life there, and it did that spectacularly. But in my mind, it was also a foodie tour. 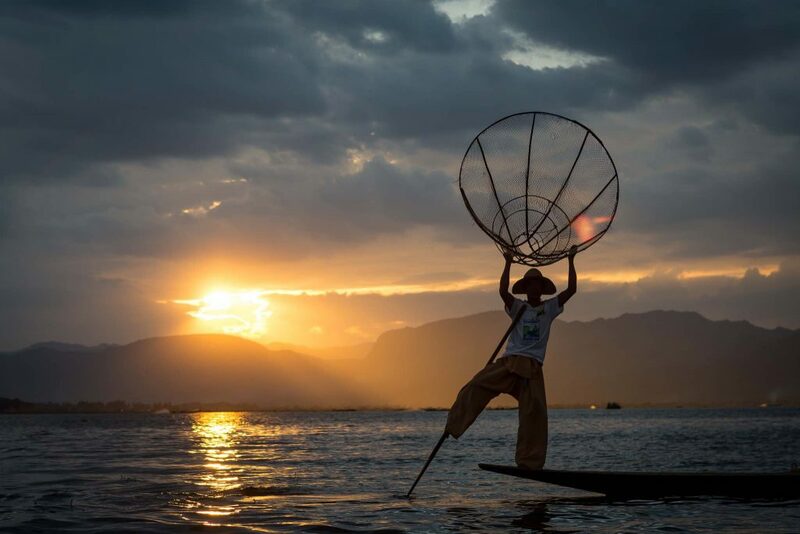 There are about three days worth of activities on and around Inle Lake. Before visiting, I just knew it as the place with the photogenic fishermen. We made several trips across the lake by boat. Just as you think the lake is about to end, you glide into a narrow channel between floating gardens of tomatoes before coming to a village. Houses rise above the surface on long wooden stilts. Even Buddhist monasteries stand among water villages. There are occasional restaurants and resorts that cater to tourists and a few weaving studios where woman are occupied with silk, lotus root, and cotton weaving. Go at the right time of day and you’ll see fisherman at work. Some fisherman moonlight posing for photographs to supplement their income. For those with a bigger budget, hire a hot air balloon to see this landscape from above. For most, this is the reason to visit Myanmar. I’ve been twice and have loved it both times. It’s quite simply one of the top sites in southeast Asia. 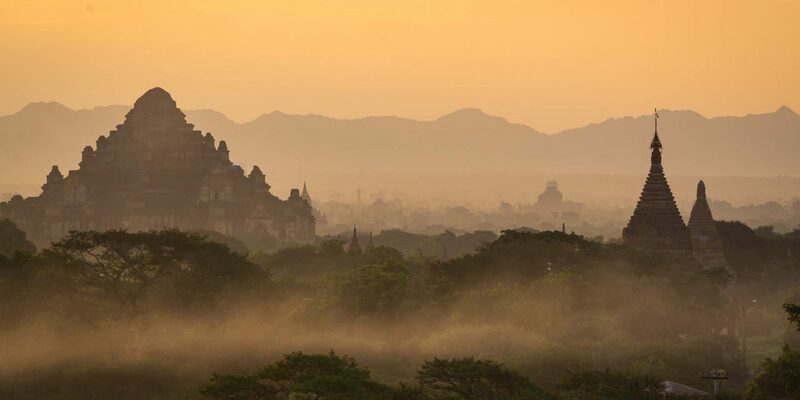 I would spend at least three days in Bagan and use a variety of transportation methods to experience this vast site. Renting electronic bicycles is a great option for independent exploration. Early morning and late afternoon are always the best time. There’s nothing like weaving through the sandy roads between temples and saying good morning to a passing shepherd and his flock. Get to your pagoda of choice at the end of the day and watch the soft light illuminate the hundreds of temples and pagodas as the sun sets. If cooling off in a former Hill Town sounds like your idea of a good time, then head to Kalaw. Situated at 1320 meters (4330 ft), temperatures are more moderate than tropical Yangon and dusty Bagan. 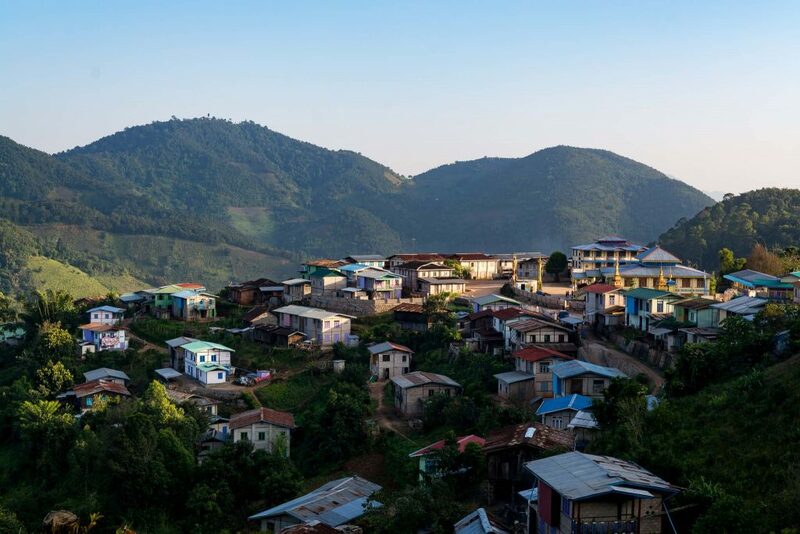 Kalaw is a great place to hike in the hills from village to village or do a multi-day trek. 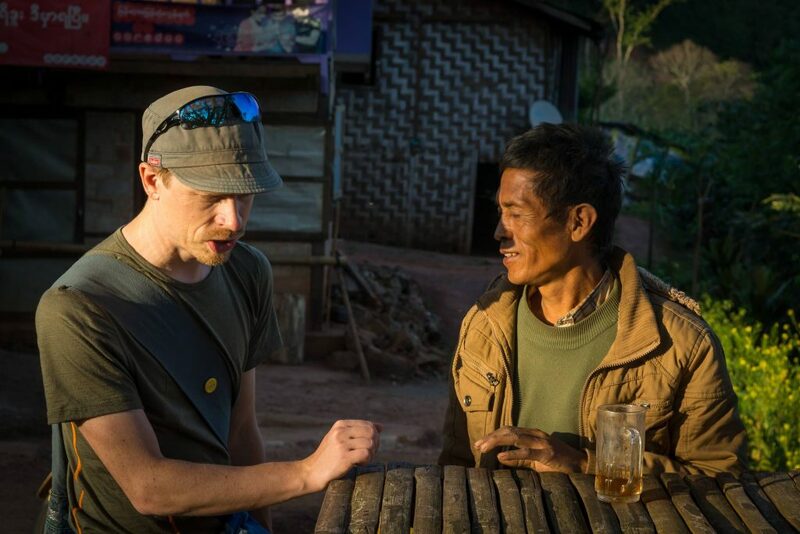 As with any place in Myanmar, the locals in Shan State are incredibly friendly. Stay a couple days and get out to the villages. In most place, you ride a train to get from point A to point B quickly and efficiently. 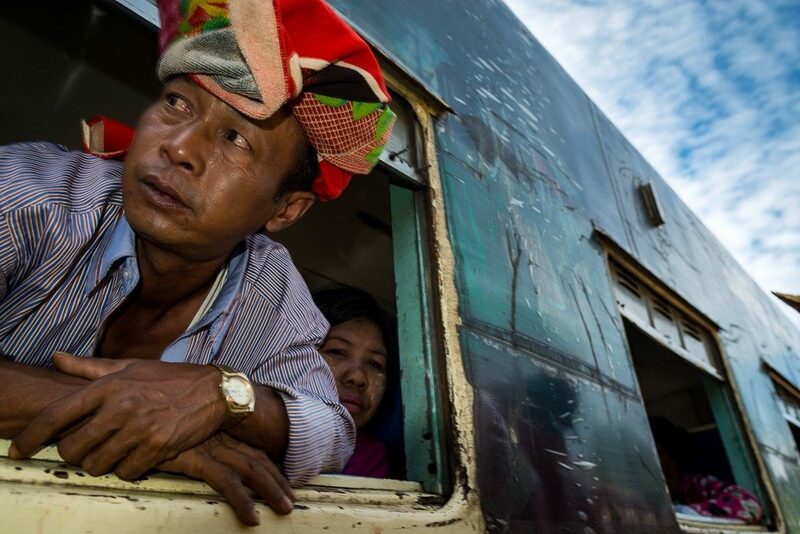 In Myanmar, the trains work in neither of these ways. And that’s precisely why should ride the rails. Trains here are slow, rickety affair. Maybe a little dusty. But always interesting. Whether you are riding the circle line around Yangon or the link between Inle Lake and Kalaw, you will get a better appreciation of life here. While the train lingers at stations, bare-chested men haul sacks on and off. You’ll be approached by women selling food items and be greeted by someone who’s curious about where you’ve come from. And best of all you’ll lean back in your seat after pulling out of the station and enjoy the view outside your window. 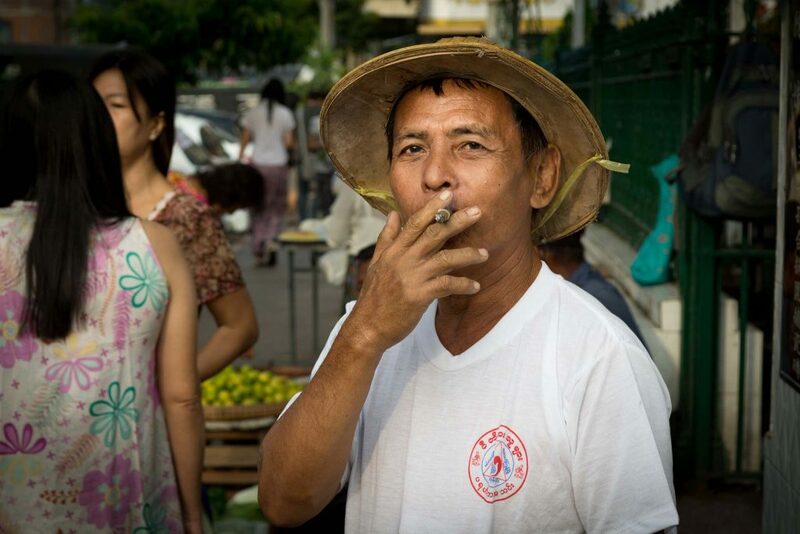 People of Myanmar are some of the friendliest in the world. And everywhere you go, someone will be willing to have a conversation. It’s a great way to learn about this country and discover how people live. 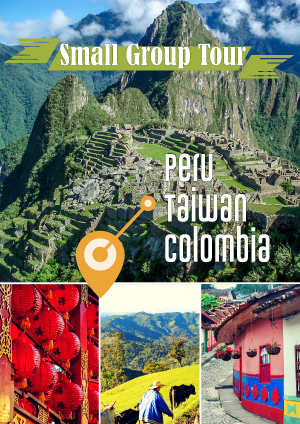 There are numerous ethnic groups with distinct cultures which makes traveling here even more interesting. Make some friends. You might even have some fun. On a walk around Yangon, we met the coach for the national volleyball team near an outdoor neighborhood court. By the end of the conversation, I had joined in with the game!